Important: Available once step 1. Initial Processing has been completed and the Reflectance Map has been generated. 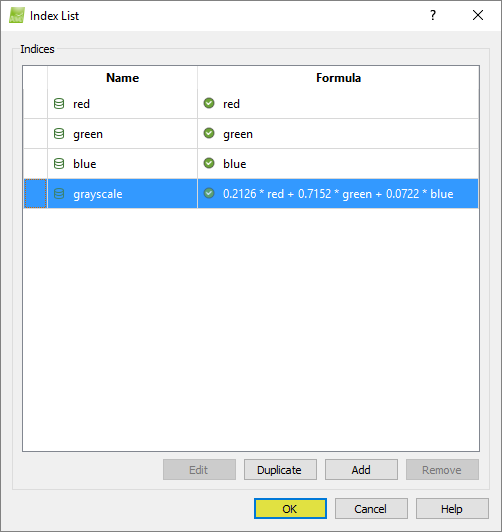 Warning: When an already-generated Index formula is modified, by clicking Generate, results of the selected Index will be overwritten and results of the Colored Mosaic Index will be deleted. The Index Maps and Index Grids are calculated for some specific band(s) from one or more groups of images. Therefore, information from one or more Reflectance Maps may be used. The Colored Index Maps are obtained by applying the defined coloring rules to the Index Maps. 2.2.1. To select an existing Index: click on any index Name and click OK.
2.2.2. To edit and select an index from the software index database: How to work with Indices - Formulas in the Index Calculator. 2.2.2. To edit and select a user defined index: How to work with Indices - Formulas in the Index Calculator. 2.2.3. 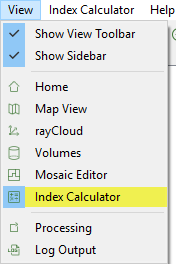 To create and select a new index: How to work with Indices - Formulas in the Index Calculator. Enabled if the user defined Index formula is a valid formula. Grayed out if the Index formula is an invalid formula. The Index Map / Index Grid files will be stored in: ...\project_name\4_index\INDEX_NAME.